Anoush Khazeni is a fanatic Beatles fan and you can see that the Fab Four have definitely had an impact on his music. 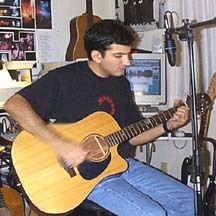 Anoush, who lives in San Francisco's Bay Area, has recorded some catchy tunes in his home studio and offered them on the MP3 site under the name "Chordaholic". "I've been a music fan all my life," Anoush says, "and ever since I picked up the guitar as a teenager, I've hardly been able to put it down. I literally became a 'chordaholic' .. : - ). In recent years, I've been taking songwriting and composition a bit more seriously and it's been almost four years since I put together my bedroom recording studio and started writing and recording my own songs in it."